The Murder of Charlotte Dymond | Launceston Then! 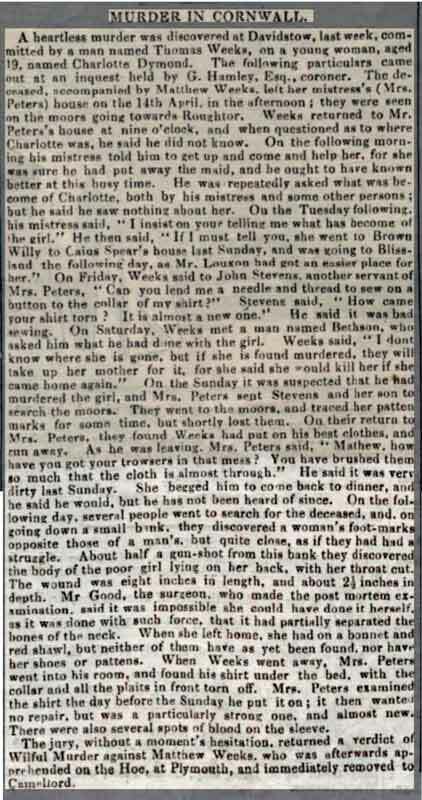 This tragic story from 1844 of a spurned love actually took place outside of the Launceston area, but because of the links to Launceston it has been included. 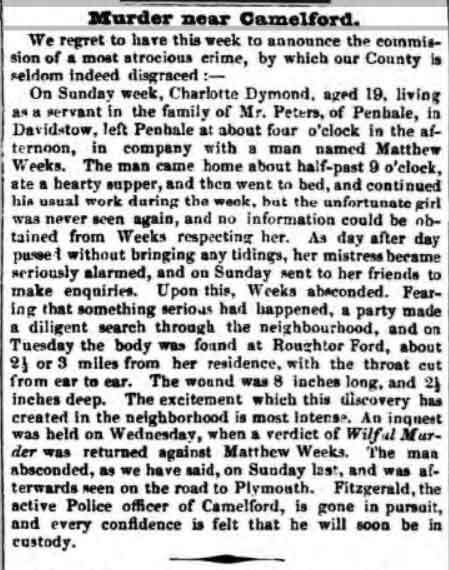 This story has long been one of differing views and opinions as to the causes and guilt of whether Matthew Weeks did actually take the life of Charlotte Dymond that damp and murky Sunday on the 14th of May, 1844. Matthew was born in 1826 to John and Jane (nee Hicks) Weeks of Larrick, Lezant. Charlotte was about the same age as Matthew and both had come to work for Phillippa Peter at Penhale, Davidstow on the edge of Bodmin Moor. It is believed that Charlotte was illegitimate. With still no sign by the Wednesday Mrs Peter was openly accusing Matthew of making away with Charlotte out of jealousy, but Matthew continued to stick to his story. By the following Sunday, things had come to a head, and worried for her safety, a search for Charlotte was commenced with John Peter and John Stevens going out out to check on the truthfulness of Matthew’s story. Matthew also left the house and in his absence Phillippa and her daughter Mary Westlake searched his room finding nothing that could possibly incriminate him. However when the two John’s returned they confirmed that the stories that Matthew had given were false. An inquest was held at Camelford the following day, held by the coroner, Mr. G. Hamley, where the jury returned a verdict of ‘wilful murder’ against Matthew Weeks and a warrant for his arrest was made. A constable Fitzgerald was given the task of finding Matthew and he followed a trail from Coads Green to Plymouth, where Matthew had a sister. It was on Plymouth Hoe that Matthew was found and immediately arrested. Charlotte was laid to rest on April 25th, at Tremail. Matthew, meanwhile, was remanded in custody and his trial began at Bodmin assizes on August 2nd, 1844, starting at 9 o’clock in the morning. Matthew was defended by a young Richard Peter who would later open his own law practice in Launceston. Mr. Good who had performed the post mortem, was asked if the wound could have been self inflicted and although he initially stated that it was possible, he later in describing the wound, insisted that it was in fact impossible for Charlotte to have caused such a fierce wound. The judge in his summing up agreed that it was next to impossible for the wound to be self inflicted, and that Charlotte had been murdered. Twelve hours after the jurors had been empanelled they filed out to make their decision. At twenty four minutes past ten they returned after only 35 minutes of deliberation to bring in a verdict of guilty, and Matthew was sentenced to be hanged. Matthew throughout the whole day of his trial, was said not to have betrayed the slightest change in his demeanour until the Judge directed his body to be buried within the presincts of the prison, when he fell back apparently in a fainting state, and was carried from the dock. Crowds flocked to Bodmin on the day of Matthew’s execution with an estimate of about 20,000 people congregating before the Gaol. At noon on 12th August 1844 Matthew Weeks was led from the Gaol, and hanged in accordance with the law and was buried in the coal yard adjoining the Gaol. *Denotes taken from Linda Stratmann’s excellent web page on the subject. The story has been made into films and many a book has been written on the tragedy. As has already been stated there are all kinds of theories on the murder including one by the Crime Write Pat Munn in which she believes Charlotte took her own life. Whatever the truth maybe, there is a school of thought that Matthew wasn’t offered the best council , which in itself is quite a shock as Richard Peter would become a highly regarded and successful attorney. The story has quite a poignant aside for this author as it appears that Matthew is a distant relation, which has made it all the more personal. Charlotte and Matthew’s young lives were cruelly taken that is for sure, and their story, however controversial, lives on some 180 years later. 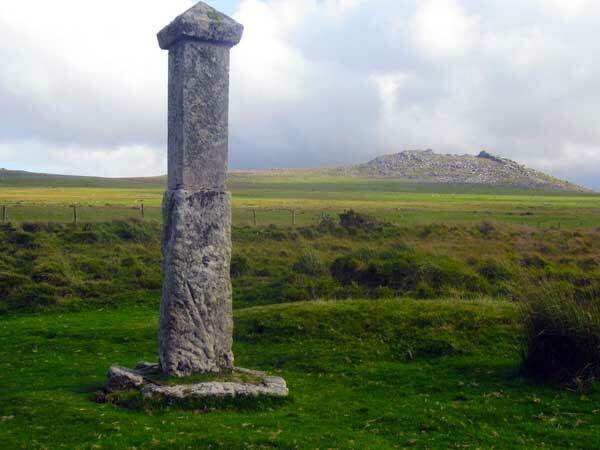 The Charlotte Dymond Memorial at the foot of Roughtor. Charlotte Dymond murder trial Pdf.